A virtual unknown before declaring himself president of Venezuela, it seems that Guaido’s only qualification for the job is a willingness to open up his country’s vast oil reserves – and much more – to US companies. If it seems like we’ve been here before, that’s not just déjà vu talking to you. Reminiscent of Ukraine’s 2014 Maidan uprising, which saw US officials dictating the political makeup of the unelected opposition government, something equally sinister is taking place in Venezuela where Washington is working to topple the “Maduro regime” and replace it with a puppet ruler. The name of that puppet-in-waiting is English-speaking, US-educated, Obama doppelganger Juan Guaido, 35, who in a very short period of time went from relative obscurity – 80 percent of Venezuelans reportedly never heard of him just one month ago – to declaring himself the interim president of the Latin American country. How on earth does something like that happen? In reality it doesn’t, unless there are some very powerful forces aligned behind the individual. Guaido was not even a high-ranking member inside of his own party, Popular Will, yet in early January was handpicked to be President of the National Assembly, Venezuela’s unicameral parliament. 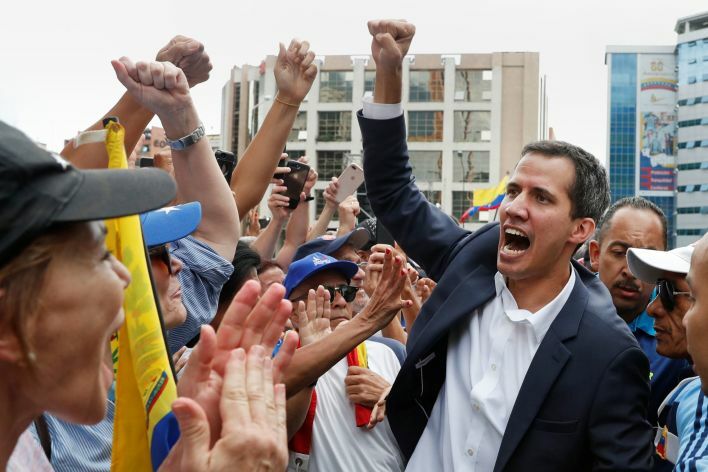 This set the stage for Guaido to be positioned as some sort of legitimate usurper to residing President Nicolás Maduro, whose victory at the polls was declared “fraudulent” by the opposition, despite the fact that Venezuela has one of the most transparent election processes in the world. In other words, what we have here is a classic domestic political dispute, much like what is happening in France for the thirteenth weekend in a row. Yet that has not prevented the United States from exerting extreme pressure on the situation – not on Paris, of course, but on Caracas. Which begs the question: are the French people any less worthy of intrusive American meddling in their domestic affairs than Venezuelans? Why the double standard when it comes to not sending humanitarian aid packages to the taxed ‘Yellow Vest’ protesters? And how is it that the government of French leader Immanuel Macron can arrest the leader of the “hateful mob,” as he described them, without any recriminations from the Western mainstream media? I shudder to think what sort of hell will rain down on Venezuela should Guaido suffer a similar fate. But I digress. Members of the most-righteous Republican Party, as well as high-ranking officials inside of the Trump administration, have taken an active role in energizing the Venezuela flare-up, goading the opposition while prodding the military into rallying behind Juan Guaido. Is it any coincidence that the very next day Guaido – with the ironclad blessing of the United States – unilaterally declared himself interim president of Venezuela? Incidentally, there’s a rather hefty footnote to the Venezuela crisis that the media has not been talking about. In 2017, Goldman Sachs bought about $2.8 billion (at 31 cents on the dollar, or about $865 million) for bonds issued by Petróleos de Venezuela SA in 2014, the Wall Street Journal reported. “Those bonds double in value if Maduro goes,” Jan Dehn, head of research at the Ashmore Group told Forbes. But that’s just the icing on the crap cake. The White House has already assembled a squad of ‘shock doctrinaires’ to deal with the Socialist patient once it’s prostrate on the operating table. Harvard professor Ricardo Hausmann, for example, who once served as Venezuelan economic minister is now Guaido’s on-call adviser. So what to make of this convoluted ball of wax? Is this all just a warning shot across the bow of the Maduro government to either accept American diktat or else? We’ve seen such strong-handed tactics before by the Trump administration in places like North Korea where a lot of heated rhetoric eventually simmered down into negotiations and, to everyone’s surprise, some semblance of peace. Trump is a businessman, after all, and he makes a point of prompting talks with a lot of swagger and bluster in an effort to throw the other side off balance. It’s a risky game in an age of nuclear weapons, but thus far it has worked. Nevertheless, with all of the notable hawks in the Trump administration squawking aggressively, it looks as though another US military intervention were on the horizon. However, and this is a serious factor, the Venezuelan people are still behind Maduro, and the threat of a US invasion – real or imagined – has had the effect of galvanizing that support. A full 86 percent of the people have no desire to see the Libyan business model imposed upon them. Meanwhile, Juan Guaido proved his political ineptitude and overall gullibility when he commented this week that he “may authorize a US military intervention.” That’s a very poor reading as to how the world – at least the world according to America – has been working. These days not even US Congress is empowered to authorize such things, since most presidents (before Trump, who, to his credit, has kept the US out of military smashups) act unilaterally when it comes to mandating military aggression. Moreover, Guaido will simply have no say over such matters, of course, if push comes to shove. The fact that the young political upstart seems to think otherwise suggests the White House may have stumbled upon the perfect tool in its regime change toolkit, which hasn’t been opened in several years. Hopefully, Trump won’t be tempted to reopen it any time soon.